Today Anthony Veder has taken delivery of two 10,000cbm combined gas carriers, which can transport liquefied natural gas (LNG) and petrochemical gases including ethylene (LEG). 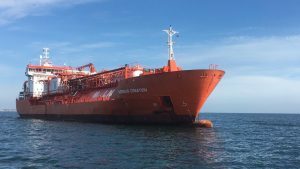 With this transaction Anthony Veder expands its fleet to 33 vessels and reinforces its leading position in small scale LNG. With eight small scale LNG vessels the company continues their strategy to support the potential for LNG as a marine fuel and in the distribution of LNG for power supply. The gas carriers were part of the Skaugen fleet and are renamed Coral Favia and Coral Fungia. As an integrated shipping company, Anthony Veder will take over the commercial operation and ship management from the current managers.